Although classified as among the worst of the “peacetime” disasters involving a ship at sea, the MV Dara was mysteriously destroyed and 238 of her passengers killed by a bomb that someone planted in the bowels of the vessel. 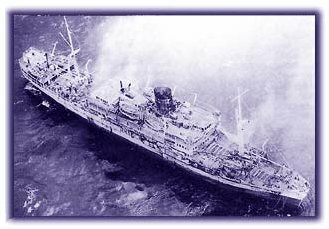 The sinking occurred April 8, 1961, while the Dara was anchored at sea, just off the coast of Dubai to ride out a storm. First Officer Peter Jordan said the explosion originated near the ship’s galley. The force of the blast went through the engine room bulkhead and up through two decks that included the passenger and main lounge. It disrupted all electrical, fire fighting and steering gear leaving the ship at the mercy of the fire that swept the vessel. Jordan said the 819 crew members and passengers on board were attempting to launch lifeboats and brave the storm to escape the flames, but a Norwegian tanker pulled alongside, taking passengers off the decks of the burning liner as well as rescuing those who had put to sea. While he could not recall the name of that tanker, Jordan remembered the name of the nearby ship that refused a rescue because the captain claimed it was carrying explosives. This was the Empire Guillemot. The Dara was owned by bye British Indian Steam Navigation Company and made regular trips between the Arabian Gulf and India, carrying expatriate passengers. It was never clear who planted the bomb, or why it happened. Some have speculated that the bomber may have perished with the other victims on the ship when the bomb exploded. The vessel was under the command of Capt. Charles Elson, and was steaming from Bombay to Basera, calling at various ports on the way. It arrived at Dubai on April 7 and was in the process of unoading cargo and changing passengers when a violent storm developed. Captain Elison decided to take the ship out of harbor to ride out the storm. Passengers on her decks were not given time to get ashore and consequently got caught up in the disaster that followed. These included people boarding to travel, friends who were seeing them off, cargo workers and even immigration officials. It was while the Bara was returning to the harbor at about 4:40 a.m. the next morning that the bomb exploded between decks. Three British frigates and a U.S. destroyer sent crew members aboard and they were able to get the fire under control. The Glasgow salvage ship Ocean Salvor took the liner under tow but it sank on April 10, before it reached port.